Office 2011 for Mac includes Word 2011, Excel 2011, PowerPoint 2011, Outlook 2011 and Messenger for Mac 8. Delivery via eMail. The license is valid indefinitely for one computer. Moving to another computer is not possible. As we offer you the Mac Office 2011 Home & Business solution for one PC exclusively via download, you are saving time as well as money. Within 24 hours of receipt of your payment, you will receive a download link and activation key and can start right away. The installation of the Office suite is self-explanatory, as is the activation of your product. Nevertheless, we are available to assist you with questions or problems. Simply use our convenient ticket system. The idea behind the Mac OS X Office 2011 Home & Business software suite is to offer smaller companies and individuals the security of the Mac operating system paired with extensive Office solutions. This is exactly what we achieved. With us you get the Home & Business version of Mac Office 2011 with one licence at a very reasonable price and are henceforth well prepared. The Office suite includes four individual applications that you do not want to be without either professionally or in your personal life. Word 2011 allows you to create purposeful documents and have access to meaningful visual effects. Word 2011 also has a spell checker that tracks your mistakes. PowerPoint 2011 allows you to create presentations and shows in a jiffy. Excel 2011 is the spread sheet program that allows you to create charts and tables and keep a watchful eye on your finances. Finally, you can also use Outlook with Office 2011 Mac Home & Business version for a PC. The email program combines different email services in an application and provides you with reliable email delivery. The Mac OS X operating system from Apple is becoming more and more popular. However, if you are using a Mac, you usually need Windows compatible programs, so you can share files and presentations with Windows users. To enable you to do this, in our online shop, we offer Office 2011 Mac Home & Business software suite with one licence. The software solution provides the best support for all your daily work requirements and allows you to present yourself professionally. The Mac Office 2011 for Mac Home & Business Office suite ensures that the files you create can always be viewed by Windows users. The individual applications correspond to the usual Microsoft content and support all major file formats. You can easily share the files created on the Mac with others via email or cloud services and even edit them together. 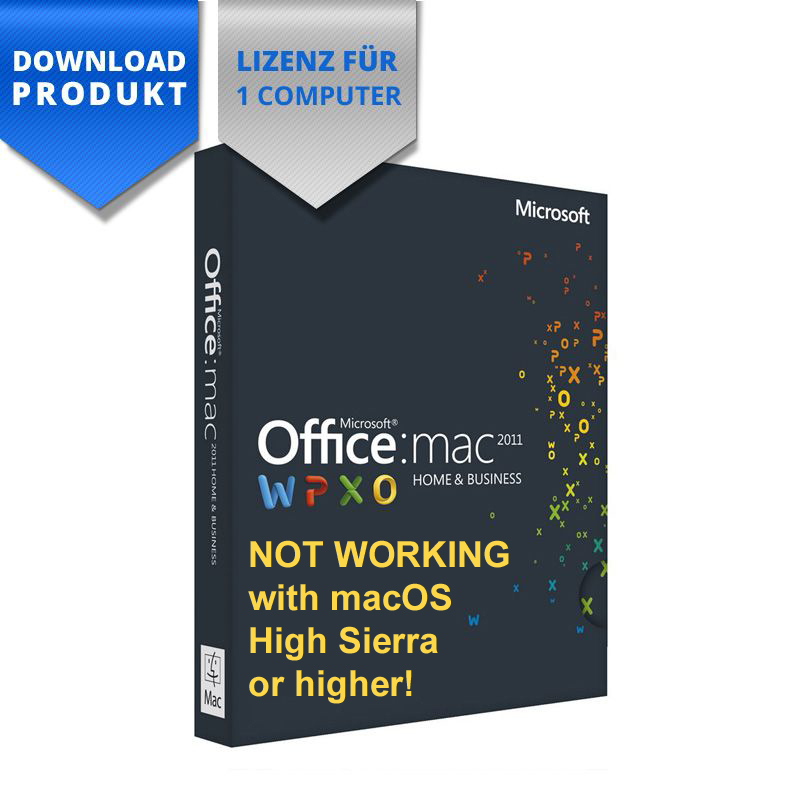 Thus, the Home & Business Edition of Mac Office 2011 is best for you, if you do not want to give up your Mac in the home office.